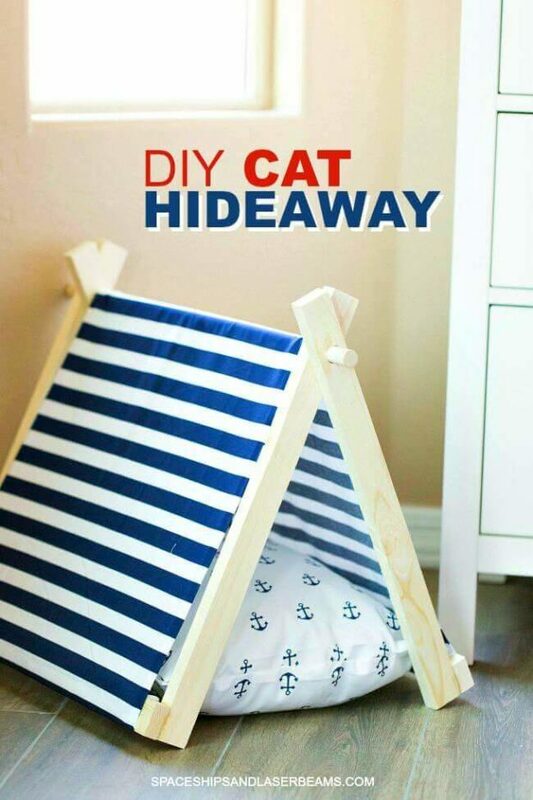 DIY cat hideaway idea that looks cute. 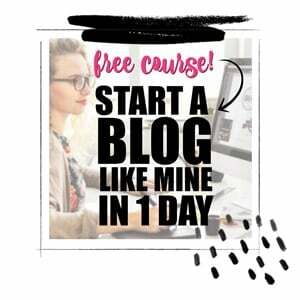 Ever heard “that’s about as easy as herding cats”? If you have a cat—or as in my case, cats—you know the truth of that statement! Kitty goes where he wants and does what he wants. It’s part of his charm. But I’ve found a way to at least know where my cats are hiding and they still think it’s a secret. We both get what we want and I call that a win! Thanks to Rachael Ray™ Nutrish® Indoor Complete Chicken with Lentils & Salmon Recipe for sponsoring this post and inspiring me. We started out with just one soft fur baby but when a friend’s cat had kittens last year, we couldn’t resist adding a new kitty to our family. Well…I was the first one smitten but once my boys saw him, everybody wanted to add Alistair to our tribe. It must be a genetic thing. Because of their independent nature, you might think cats would travel light. But no. Let me warn you: There’s a lot of paraphernalia that comes with a cat. Pull toys, stuffed rodents, claw poles, climbing towers, and laser lights are just the beginning. They want your laundry basket when it’s full of clean clothes waiting to be folded. 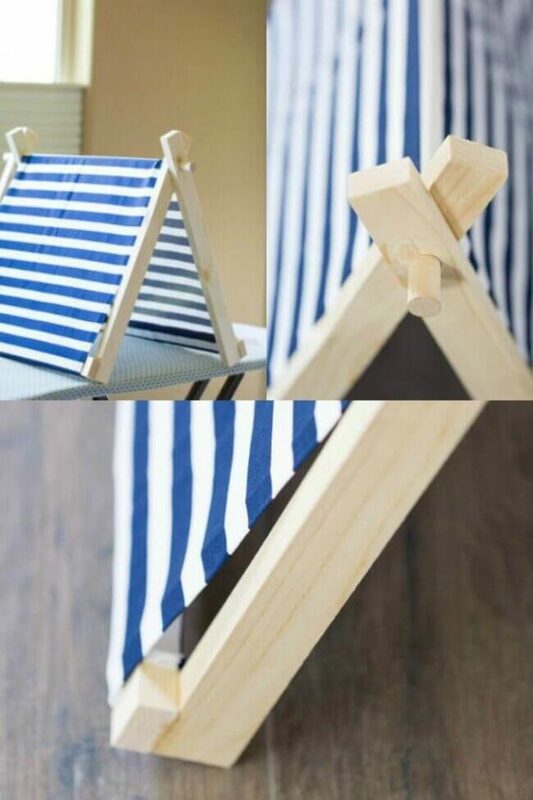 They want to stretch out on your favorite chair. They prefer sleeping on your pillow. Then there are the cute food and water dishes. And litter boxes that you want to hide. Cats want to take over your life. And once they’re part of your family…you are OK with that. You might even find yourself daydreaming of ways to make them happy. That’s how I came up with this sweet DIY cat hideaway idea. Since cats like to curl up in cozy, tucked-away spots, I decided a miniature teepee would be a cute way to meet that need. And maybe take back my own pillow. 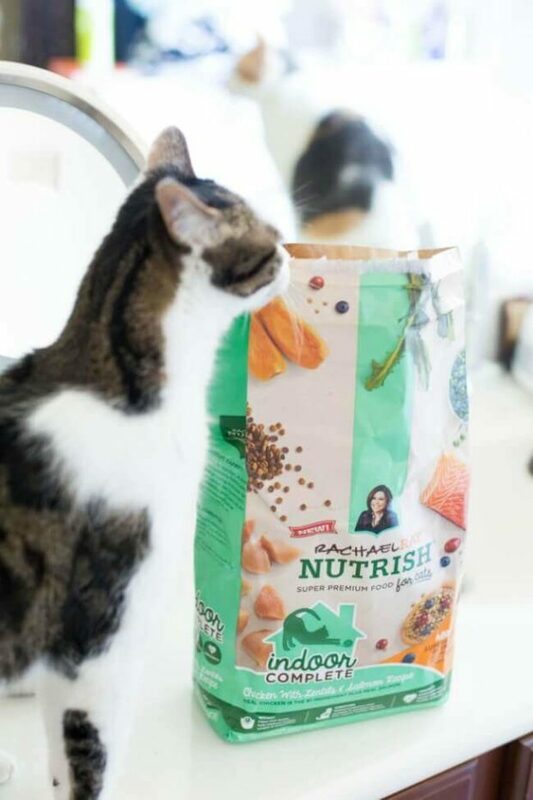 Rachael Ray—yes, that celebrity cook Rachael Ray—must be a cat lover, too, because she created Nutrish® super-premium food for cats. 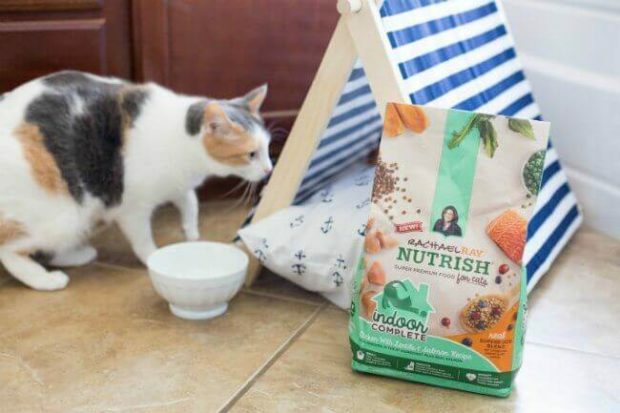 She had some help from cat nutrition experts so Nutrish® is made with wholesome ingredients like real meat and fish and there is not any poultry by-product meal or fillers. My cats highly recommend it. 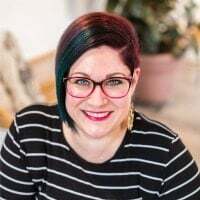 Part of the proceeds from each sale of Nutrish® is donated to the Rachael Ray Foundation and they help animals in need with food, medical supplies, and treatments. 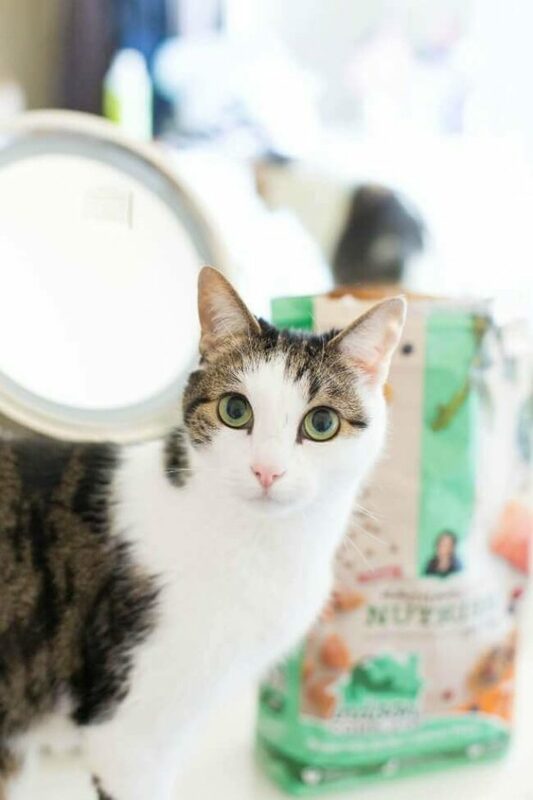 If you have a soft spot for animals, you can feel good about feeding your own pet quality Nutrish®, knowing you’re also helping animals who might not be getting the love they deserve. And if you want to make a soft spot for your own kitty, this is how to create a tent, just their size. The instructions look more complicated than what it takes to build the teepee. Kitties love curling up in there. They think it’s their idea—no herding necessary! Cut the 1×2 into 6 20-inch pieces and 1 16-inch piece. On 4 of the pieces, mark 2 ½ inches from the end of the boards. Drill a hole in the end of each of the 4 boards. Lay the boards out on their sides and place the dowel road through each side, allowing about 2 inches of the dowel rod to stick out on either side. 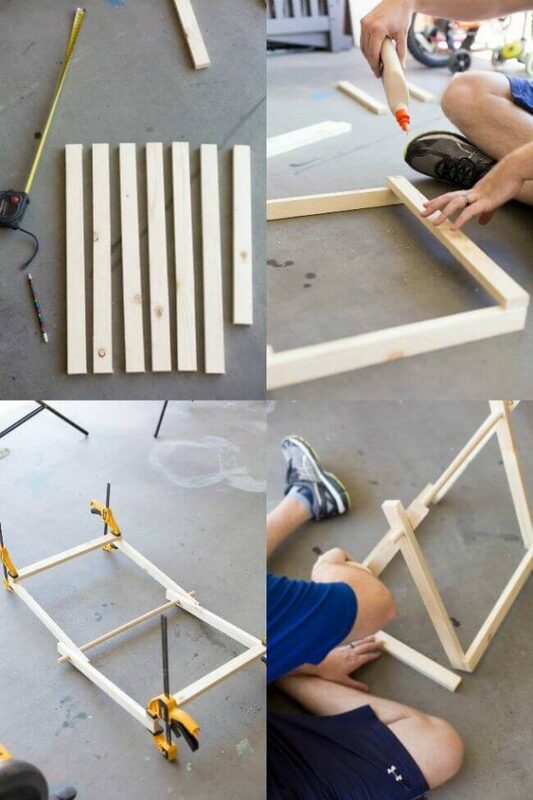 Lay the frame out flat and glue the other two boards to the ends of the frame. 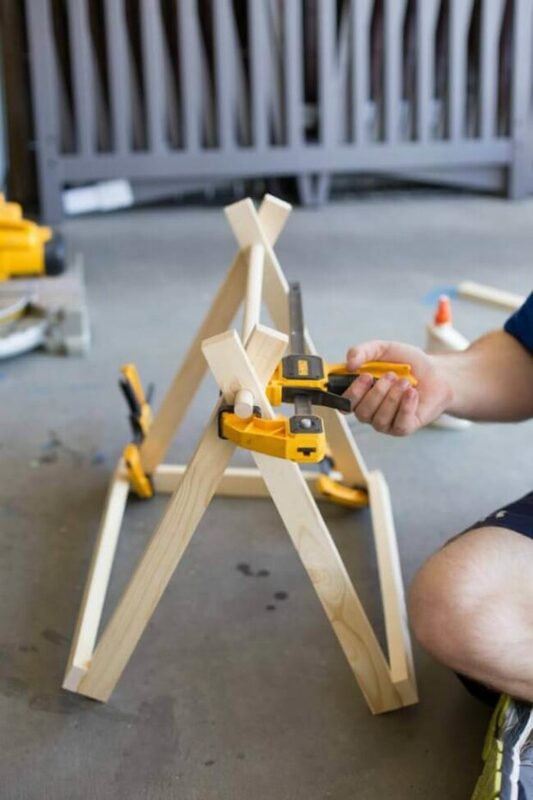 When dry, stand the frame up and glue the remaining piece of wood onto one side of the tent. Then glue the top pieces together. Allow time to dry. Cut a piece of fabric that is 20” x 44”. On the long side of that fabric, fold a half inch of the fabric down and iron it to stay. Repeat with the other side. Drape the fabric over the frame to ensure it will fit correctly over the dowel rod. Make any needed adjustments. (If it’s too big, increase the hem line, if it’s too small, decrease the hemline.) Use fabric glue to secure the hem. Drape the fabric over the top of the tent and wrap underneath the frame. Apply 5 sets of Velcro across the edge of the fabric and wrap around the bottom leg of the tent. Press the Velcro down to secure. Repeat with the other side, making sure to pull the fabric tight around the frame. Add a pillow, blanket or scrap fabric inside for kitties to lay on.